John Fallon reports from Eamonn Deacy Park. LIMERICK BOOKED A place in the semi-finals of the FAI Cup with a double strike in the second half to kill off the Galway United challenge. Staying in the top flight might be the primary aim for both these sides but now Limerick deservedly find themselves in the last four of the cup after an accomplished display. Both sides struggled to create decent chances in a drab opening half but yet they had opportunities to break the deadlock. Unmarked Barry Cotter should have done better with a header inside the box after ten minutes after one of many good crosses from the right by Lee Lynch. Limerick goalkeeper Brendan Clarke was alert to deal with a looped effort from Eoin McCormack 13 minutes from the break, while shortly afterwards he dealt with a good shot to the bottom left corner by Gavan Holohan. McCormack again threatened with a lob from the left four minutes from the interval but Clarke was well positioned to deal with the effort. There was a much better tempo to the start of the second-half but while Kevin Devaney went close for Galway, it was Limerick, with Bsstien Hery superb in midfield, who hit the front through Brazilian Rodrigo Tosi. Galway ‘keeper Conor Winn, who had just saved superbly from Lynch, was only able to parry an effort from Stephen Kenny and Tosi followed up to finish from close range after 53 minutes. 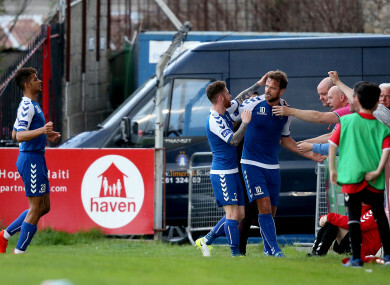 The homes side hit back but efforts from Devaney and Holohan were off target before Limerick doubled their lead after 64 minutes when good work by Tosi and Chiedozie Ogbene set up Shane Duggan and he found the net with a good strike from inside the box to make it 2-0. Galway were given a lifeline eleven minutes from time when an effort from Devaney was knocked into the path of Padraic Cunningham by ‘keeper Clarke and he found the net from close range. However, Limerick put five players at the back and Galway never looked like grabbing an equaliser. Galway United: Conor Winn; Colm Horgan, Paul Sinnott, Stephen Folan, Marc Ludden; Kevin Devaney, Rory Hale (Conor Melody 91), David Cawley, Gavin Holohan (Ronan Manning 69), Ronan Murray; Eoin McCormack (Padraic Cunningham 68). Limerick FC: Brendan Clarke; Barry Cotter, Tony Whitehead, Dave O’Connor, Shane Tracy; Stephen Kenny (Joe Crowe 84), Lee-J Lynch, Shane Duggan, Chiedozie Ogbene; Bastien Hery, Rodrigo Tosi (John O’Flynn 86). Email “Limerick hit Galway on the double to reach FAI Cup semi-final”. Feedback on “Limerick hit Galway on the double to reach FAI Cup semi-final”.